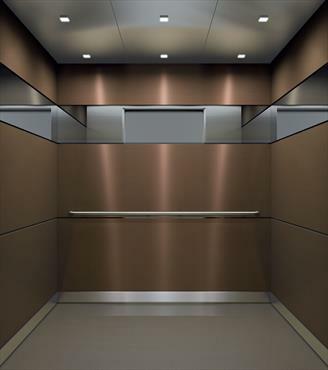 Adequate lighting and 3 – phase power supply for both the elevator and the installation hoist, temporary or permanent positioned according to the lay-out drawing. Lifting hooks and ventilation duct positioned in the top of the shaft according to the lay-out drawing. Finished floor level markings on each landing floor. Lift shaft and pit cleaned and pit waterproofed. Suitable material storage areas agreed with the builder adjacent to the lift shaft. Suitable storage area with locking facility for the installation tools. Clear, unobstructed access routes to at least one entrance, at or next to the ground floor, for long / bulky items defined and clear of obstructions. All landing openings are well protected with coverings. Lift shaft dimensions and tolerances in accordance with lay-out drawing. Suitable provision for disposal of waste materials. Shift all lift materials, installation tools, hand tools to the appropriate locations. Try, where possible, to store materials near to their final positions in the installation. Check all personal safety equipment (PPE) are available and in good conditions. Check all materials are correct and the delivery is complete. Connect the three phase power supply to the hoist and check the operation of the hoist safety functions. Mount the hoist driven pulley on to the center hook in the shaft top with the help of suspension bar and connect the hoist rope into the hoist. Lift the hoist into the shaft. Keep the control of the hoist on the lowest floor. Test the load hook capacity with the help of hoist test bracket. Position correctly the over speed governor hanger rod in the load hook in the shaft top. Slide the over speed governor on to the rod, fix the governor and align the base plate. Slide the rope into the over speed governor groove and let the rope ends go down into the pit. Arrange the shaft plumbing jig as per the shaft dimensions and distance between guide rails (DBG). Fix the plumbing jig support on the front wall of the top most landing floor. Mount the plumbing jig on to the jig support and adjust the plumbing jig position in accordance with the lay-out drawing and tighten the jig with the help of clamps. Hang four nos. of plumbing weights (2 nos. for car guide rail location and 2 nos. for front wall location) into the pit and make sure that the plumbs are steady and not moving. Take measurements of the lift shaft and if necessary adjust the plumbing jig position. Measure the lift well dimensions at each landing and fill in the plumbing table. Secure the plumbing wires with the steadier brackets in the pit and check the distances between the plumbing wires are correct. Clean the guide rails and install the fish plates to the male ends only and hand tighten the bolts. Mount the pit ladder in its location inside the lift pit. Check the height of the car and counter weight buffers and place it on the pit floor at the correct location and ensure its verticality. Transfer the plumb wire position to the shaft wall using a square. Mark and transfer the drilling hole position of car and counter weight guide brackets. Drill all the holes for the guide brackets and fix first set of brackets rigidly. Shift the guide rails into the pit using the hoist and support on to the shaft walls. Fix the first set of car and counter weight guide rails on to the brackets and align the guide rails for the correct DBG perfectly with the help of alignment gauges and diagonal positioning tool. Tighten all clips and bolts. Fix the second set of brackets and align the guide rails at that location. Fix the over speed governor tension weight in the pit roping to be done temporarily. Install the counter weight frame and insert into the counter weight guide rails and support the frame on to the buffer. Lift the car platform into the shaft by the hoist and slide correctly it into the car guide rails. Support the platform on to the car buffers and make sure the platform is in level. Adjust the car safety gear rollers with respect to the guide rails. Connect the over speed governor rope into the car safety gear. Position the upper beam on to the platform and lift it by hoist and hang it on the top approximately at its correct location. Mount the uprights and fix it with the platform and the upper beam. Check and ensure the verticality of uprights. Fix the car enclosure panels on three sides with the platform and uprights. Place the ceiling panels on to the car enclosure panels and fix it rigidly. Fix the kick plate and balustrade on the car roof. Install the safety pedal on the car roof and connect the rope from the safety gear arm to the pedal. Fix the third ring of guide brackets by standing on the car roof. Fit the brackets to the guide rails and align the guide rails. Attach the hoist on to the car roof as specified. Test the operation of the safety gear by pressing the pedal and drive the car upwards and downwards. Lift the balance guide rails upwards, fix all the brackets and align the guide rails completely by moving the car upwards by the hoist. Remove the plumbing jig and plumb wires. Drive the car down wards and lift the machine to the top most floors through the lift car. Fix the machinery unit on to the top most guide rail with isolation and align. Mark the finished floor level line at all landings. Mark out on the car sill, the door center line and the width of clear opening. Mark the hole / bracket positions of sill and header fixings and fix the same using expander bolts. Fix the sill and header and check the alignment of the same. Lift the door panels through the car and install and align the door panels. Repeat the same procedure for all floors except the top most landing. In place of one side frame, install the control cabinet at top most landing and align vertically. Align the door panels at top most landing. Install the front entrance panels of the car. Mount the brackets for fixing the car door operator fix and align the door operator. Fix sill and header for the car door and align the car door panels. Fix the control panel inside the control cabinet. Fix the shaft trunkings and lay shaft electrification bundles inside the trunking sections. Do the wiring connection for all landing door gate locks. Fix and connect the wiring for tension weight switch, pit stop switch and three pin sockets. Lay the travelling cable and terminate one end inside the control panel and the second end to the car top connection box. Do the wiring from the control panel to the main switch and to the machinery unit. Mount all landing call buttons and landing indicators and do the wiring. Fix the Emergency Battery Drive (EBD) panel and do the wiring. Complete all the connections in the control panel. Fix the brake lever cable to the brake handle inside the control panel. Fix the intercom and do the wiring. Fix the car operating panel inside the car and complete all the wiring. Fix the mirror inside the car. Mount the brackets for the hand rail and fix the same rigidly. Fix the curtain of lights on to the car door panels. Fix the ceiling panels under the car roof and set the lighting inside and complete the wiring. Fix the final limit switch, deceleration switches, synchronization switch, door zone switches on the car roof. Fix the car top connection box. Connect the earth wires to the earth bar. Connect all the control switches, final limit switch, door operator cables, car operating panel cables, curtain of light cables and safety gear contact cables. Lift the bottom pulley beam and place it on to the stool and set the pulley beam. Lower the car to the pit and keep the car close to the bottom pulley beam. Fix the pulley beam to the platform rigidly. Fix the diverting pulley on the counter weight frame and align. Lift the counter weight frame and place it on the correct location. Attach the car and counter weight rope anchorage brackets to the guide rails. Put the wire rope drum on to the car roof and complete the roping. Connect and align all diverter pulley rope guards. Fix the over speed governor on to the original brackets. Fix the parking plate and align. Fix the car fan and do the connection. Provide protection against adjacent live. Ensure the connection of all machinery wires. Check the any short circuit between controller wires to earth. Set the parameters as per the motor type, load, speed, using the interface from MAP panel. Check the motor Direction with RDF unit by pushing Run and down button. See that all running clearance is O.K. Drive the car just below the bottom floor with LED 61: U, 30, 77: N, and (77: S) must be lit on the board. Check for leveling accuracy and note down the readings. Prepare the test report and check list as per the format enclosed. Check Building Fire Alarm Integration. The Equipment will need regular servicing to maintain the best possible performance and safety. It is recommended that only fully qualified personnel carry out servicing.